It was on this date in 1907, that Father Vitaliy Bayrak was born. He was a Ukrainian Greek Catholic Basilian priest. Having entered the monastic life and making his profession of vows, Bayrak was ordained a priest in the Monastery of Zhovkva on August 13, 1933. His abbot assigned him to do parish work and gave him several jobs in the monastery. In July 1941 he was elected and blessed as Abbot of the Monastery in Drohobych, to replace Fr. Yakym Senkivskyy who had been martyred by the Bolsheviks. Father Bayrak was arrested by the NKVD on November 13,1945 and was sentenced to 8 years hard labor. He was beaten to death by a Communist camp guard on April 21,1946. 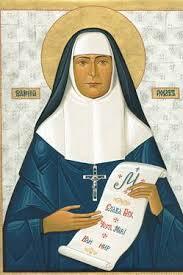 Father Bayrak was Beatified by Pope Saint John Paul II on June 27,2001. It is 112 years ago today since his birth. 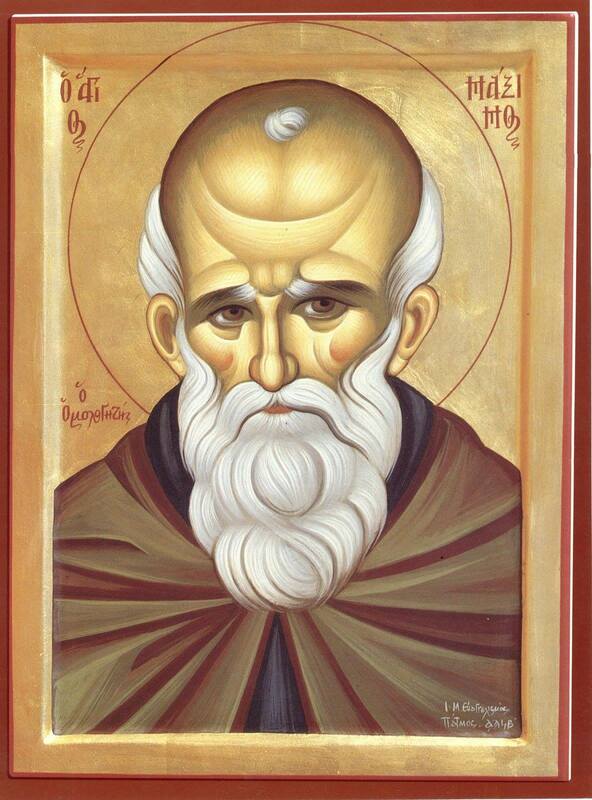 Depending on the liturgical calendar Blessed Vitaliy’s feast day could be 21 April or 16 May. Blessed Vitaliy Bayrak, pray for us. 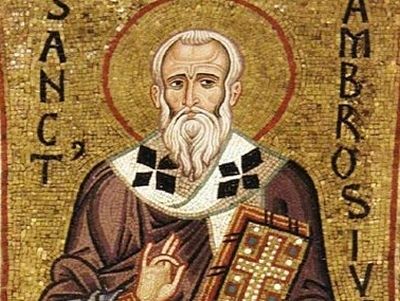 St. Ambrose was the greatest Archbishop of Milan, at a time when it was the center of the Empire. He was elected bishop when he was still a catechumen and proved to be most competent—in administration as well as theology, and was a holy and sincere Christian. 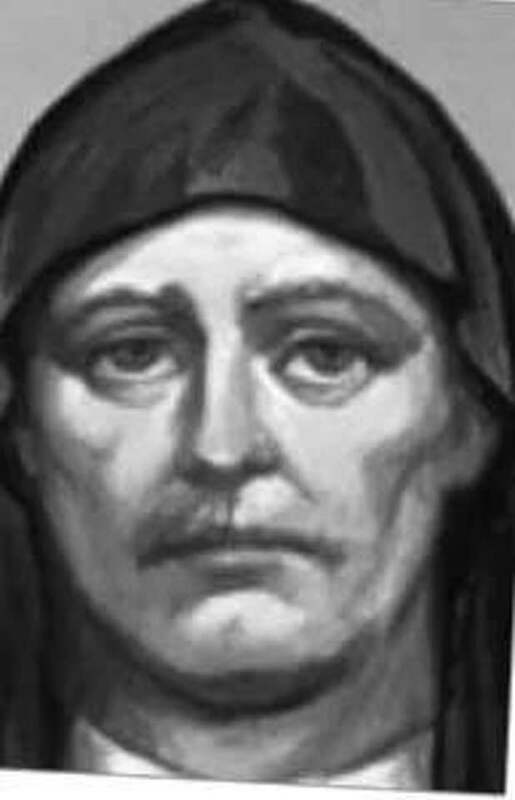 He had been a governor before and knew how “to talk to power.” When the Emperor Theodosius had 7,000 Thessalonians slaughtered over the assassination of their governor, he excommunicated him for his horrendous crime – and made it stick, bringing Theodosius to repentance. As a theologian, he wrote about the incarnation of the Son of God: “And the Word was with God . This that he said is to be understood thus: The Word was just as was the Father; since He was together with the Father, He was also in the Father, and He was always with the Father. […] It is of the Word to be with the Father; it is of the Father to be with the Word, for we read that the Word was with God. So if, according to your opinion, there was a time when He was not, then, according to your opinion, He too was not in the beginning with whom was the Word. For through the Word I hear, through the Word I understand that God was. For, if I shall believe that the Word was eternal, which I do believe, I cannot doubt about the eternity of the Father, whose Son is eternal” (The Sacrament of the Incarnation of our Lord (III, 15-18, from the Vatican web site). And again, Ambrose says, “He lay in the crib, that you might stand at the altar. He came to earth, that you might come to the stars” (Exposition of Luke 2.41). Today is the feast of Our Holy Father, Saint John Chrysostom, Archbishop of Constantinople, whose Divine Liturgy we pray most often. He is one of the most famous saints of both the Greek and the Latin Churches and one of the four great Doctors of the East. He is called “Golden-Tongued” because of his eloquence. 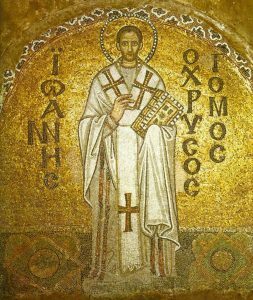 Image: Mosaic of Saint John Chrysostom, Saint Sophia, Istanbul. The gospel of John is considered the foundational gospel in the Eastern Church, and John is honored with the title of “Theologian,” for he explained well who Jesus, the Son of God, was. It is from his gospel that we know “In the beginning was the Word, and the Word was with God, and the Word was God. He was in the beginning with God. All things came to be through him, and without him nothing came to be. What came to be through him was life, and this life was the light of the human race; the light shines in the darkness, and the darkness has not overcome it” (John 1:1-5). He also showed us that love is the basis of our theology. 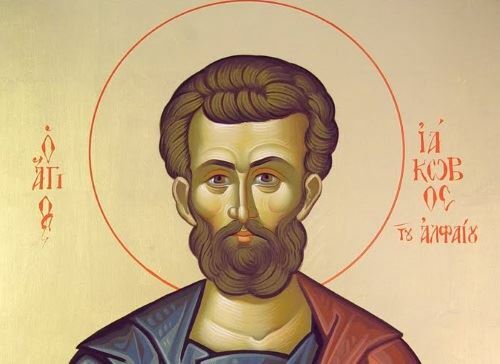 Saint John preached the Gospel in Jerusalem and Samaria, and was banished to the isle of Patmos. 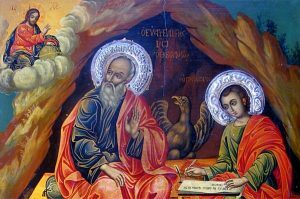 In old age, he returned to Ephesus where he made a home for the Theotokos. An ancient church marked the place until its destruction in World War I. Tradition holds that John died during the reign of Trajan, a full century after the birth of Jesus. 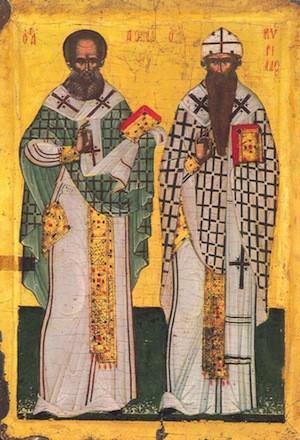 May Christ our true God, have mercy on us and save us, through the prayers of his most holy Mother, of the holy, glorious and praiseworthy apostle and evangelist, the pure and beloved friend and disciple of Christ, John the Theologian, whose venerable falling-asleep we joyfully celebrate today, and through the prayers of all the saints, for Christ is good and loves us all. Today, the Church remembers that on September 14, 407, St. John Chrysostom fell asleep in the Lord. We pray his Divine Liturgy for much of the liturgical year and read his sermons. 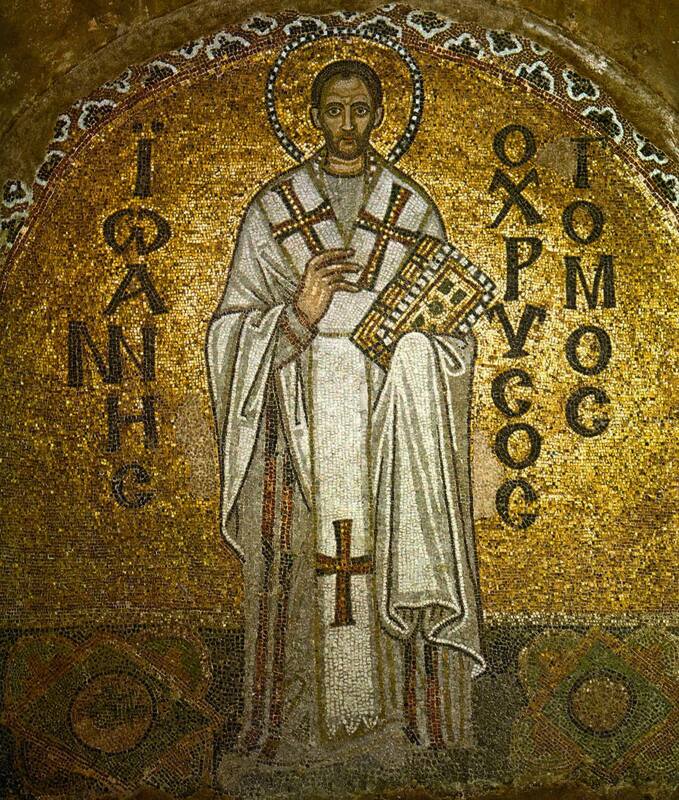 The image is of St. John Chrysostom from Haghia Sophia in Constantinople, a mosaic from the 11th century. Today is the feast of the beheading of St. John the Forerunner and Baptist. Sacred Scripture reveals that John the Baptist was a cousin of Our Lord whose mission was to preach repentance to Israel in preparation for the coming of the Messiah. The famous rebuke of King Herod for his unlawful marriage to Herodias, his brother’s wife, landed John in prison and on the wrong end of Herodias’ admiration. Concluding Salome’s dance for the King’s birthday he promised to give her whatever she asked for, even up to half his kingdom. Salome asked for the head of John the Baptist on a platter. Herod ordered the execution. We honor St. John the Baptist as the last and greatest of the Old Testament prophets. 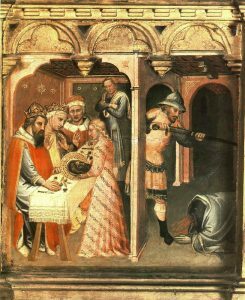 The beheading of the forerunner was indeed a dreadful crime, somehow fitting into the plan of God, for John thereby became the herald of the savior’s visit to those in hades. As for you, Herodias, cry your eyes out, bewail your deed, for you preferred murder to the law of God, rejecting eternal, everlasting life, for a false and passing one.